So yesterday I heard loads of muttering about a picture that Russell Brand had tweeted of his wife. 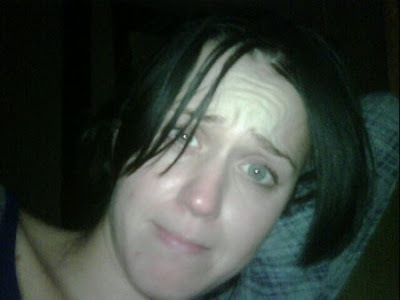 The picture of the stunningly beautiful and fabulous Katy Perry (who, FYI, I would totally turn lesbian for the day for) was taken as she awoke from her slumber sans make-up. Yes her face is a bit puffy, yes her hair isn’t its usual perfect bouffant, but she’s just woken up for fricks sake! I have to admit I wish I looked like that when I’d just been woken up, but I won’t traumatise you by ‘doing a Russell’ and showing you what I really look like in the morning. This is all very well and good, and somewhat amusing, but why is it newsworthy? I opened the paper today and there on page three was the picture of Katy and a full page article – errrr, is there nothing else to write about today? Give the lass a break. Normally she looks immaculate, but that’s undoubtedly because she has a team of stylists, hairdressers, make-up artists and assistants to help her look that way… why is she expected to maintain this while she sleeps? There have been cries of ‘thank God she’s human’, but of course she doesn’t wake up in the morning looking like Marilyn Monroe… we’ve got the pages of Heat magazine to let us know that. So ladies and gents of Great Britain, chill out and stop being so ridiculous because she looks great. I still would. I was shocked when I saw her picture only because it shows just how much slap that she does wear. I think she looks much younger or more her age without it all and dare I say better. I know she's a popstar and can't go out naked faced to premiers and her videos but I think she can get away with just her hair tied back, a bit of mascara and lip balm. That's part of her image though… I'm sure it will change with her next album as she was more natural when she first launched herself. Regardless of how much slap she wears normally I don't understand why there was so much fuss about the picture!